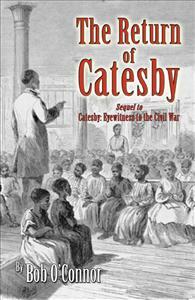 The Return of Catesby is a sequel to “Catesby: Eyewitness to the Civil War” published in 2008. In this account, Catesby, a former slave, becomes the first colored teacher at Storer College in Harpers Ferry, WV. Storer was one of the first schools in the country to be established for the purpose of educating former slaves. Catesby, a real historical character, brings his experience as a blacksmith, a veteran of the Union Army, and his survival of the famed Andersonville Prison to his students. The historical fiction story is based on Catesby’s journals, papers and letters. The Return of Catesby is a sequel to “Catesby: Eyewitness to the Civil War” published in 2008. In this account, Catesby, a former slave, becomes the first colored teacher at Storer College in Harpers Ferry, WV. Storer was one of the first schools in the country to be established for the purpose of educating former slaves. Catesby, a real historical character, brings his experience as a blacksmith, a veteran of the Union Army, and his survival of the famed Andersonville Prison to his students. The historical fiction story is based on Catesby’s journals, papers and letters.